Jim McBee's Mostly Exchange Web Log: Intelligent Message Filter configuration "typo"
However, there is one issue that Exchange admins that use it should be aware of. 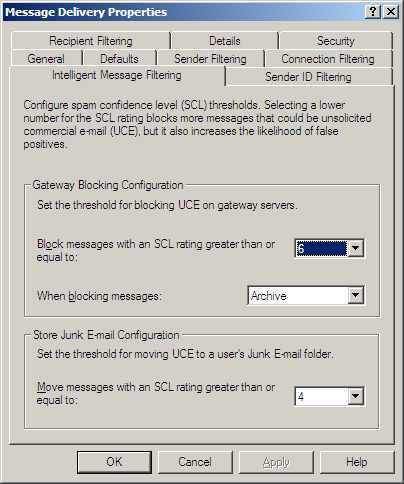 On the Store Junk E-mail Configuration section, the threshold text says "Move messages with an SCL rating greater than or equal to:" This is actually a typo and it should not include the "or equal to:". 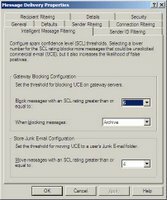 It should say "Move messages with an SCL rating greater than:" So, if you want all messages with an SCL of 5 or higher to be put in the Junk E-mail folder, you need to set the Store Junk E-mail Configuration setting to "4". Aloha from the French Riviera!